The Paradise Fish is one of the oldest of aquarium fish, known and used in Europe back in the 19th century and brought to the United States about 1876. These hardy fish survive at temperatures as low as 50 F, prefers 75 F – 78 F and are best bred at 80 F. At one time they were companion fish in goldfish tanks and ponds, and still make great additions to garden ponds, due to their propensity to eat mosquito larva and other water pests ravenously! It was one of the earliest fish kept as tropical fish in aquariums, but as species from the Amazon which were smaller and more fragile began to be kept, they became much less popular. You see, Paradise Fish, are small, about 3 inches full grown, but are very scrappy, and vicious fighters, not good tank mates for shoal fish. They are however a fantastic fish for hobbyist learning the art of breeding fish. The Paradise Fish is a Labyrinth Fish which is a Bubble Nest Builder. ​Labyrinth Fish are called this because of a curious breathing habit, has the ability to actually breath oxygen directly from the air. They live in rice paddies, and rotting vegetation pools so fowl that the oxygen levels in the water may be almost nonexistent. They possess a Labyrinth organ that allows them to convert the oxygen in the air to a form usable to the fish, as would their gills in water rich with oxygen. This unique habit of going to the surface breathing oxygen has given them an adapted method of breeding over the ages called bubble nest building. There many theories as to why Labyrinth Fish build bubble nests, and to be sure all species do not do it in the same way. Some species, like the Paradise Fish, are meticulous in their construction and care of the young, others like the Kissing Gourami simply blow some bubbles, randomly fertilize the eggs let them float off in the current and that is that. As in many other labyrinth fish, Paradise fish build nests of bubbles. The male blows out bubbles of air and mucus which rises to the surface and therefore a “raft”, for lack of a better term. Then he follows an elaborate mating ritual that has been carried out in stagnant ponds and rice paddies for thousands if not hundreds of thousands of years. The colors of the male will become absolutely brilliant to the point of disbelief as the mating time draws near (you will see where the term Paradise Fish came from at this time). Surprisingly, the female will become duller and paler during this period. When the female is ripe (fat) with eggs and ready to spawn, the male wraps himself around the female while she lies ready in a position under the “bubble raft”. This is unusual behavior for most Labyrinth Fish in that the female usually has to be violently chased and forced into mating, if anything, the female Paradise Fish is a willing participant. The eggs begin to escape the female’s vent and are simultaneously fertilized by the male as the two remain embraced and barrel roll under the nest. The eggs float up naturally, also unusual for Labyrinth Fish eggs. 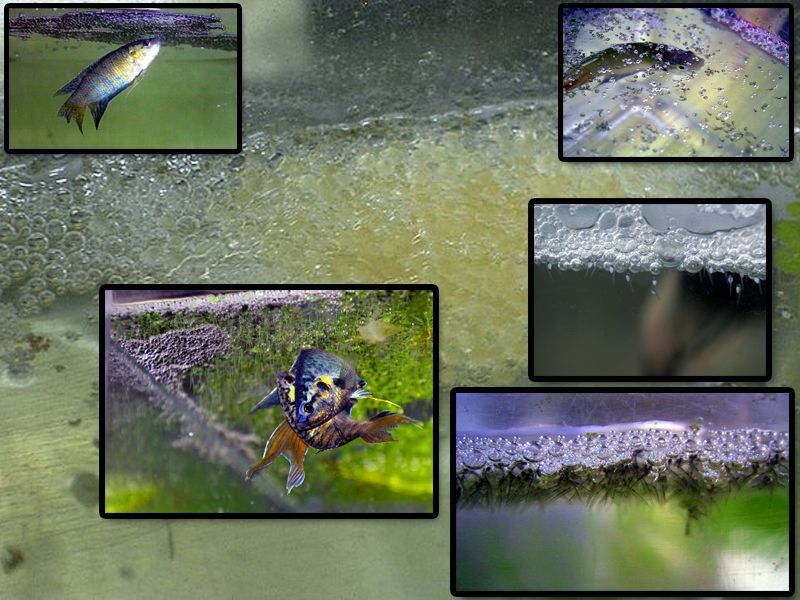 Several of the eggs will begin to sink the male will release the female who will remain motionless, while the male carefully gathers the eggs in his mouth and blows them into the bubble nest above them. He then wraps himself around her again and resumes the process over and over until several hundred to almost 500 eggs in some cases are laid. When the mating is finished, the female can be removed, but she is in no danger from the male, again unlike most Labyrinth Fish, but her job is over and she can be put in an isolation area and feed well on high protein to recover. When the clutch of eggs is completely laid, the male blows more bubbles to make a second layer under the eggs, sealing them in. This may be repeated time and again for the next 48 hours by the male. Temperature and Hatching Time: Temperature must be kept at a steady 80 F for best results for breeding to take place and for eggs to hatch in the best condition and on time. Under best conditions, eggs hatch in 48 hours. Second 48 Hours: For the next 48 hours you will only see little black hair or whisker-like things hanging down from the bubble nest. The male will fastidiously catch any fry that falls from the nest in his mouth and blows them back into the nest. DO NOT WORRY! This is normal, if he did not do this the fry would die, he is being a great dad, that is his job, the fry must remain in the bubble nest until they are free swimming. They require no food until they are free swimming; they are feeding off their yolk sacks at this point. Fifth Day of Fry: The fry will now be a free swimming cloud of tiny fry around the male, he will not usually eat his young, but it is still best to remove him back to his original tank, his parental duties are done at this point. In nature, he is looking for protein to get ready to breed again soon, so the fry are on their own at this point. Feeding the Fry Week 1-2: Infusoria, there are 2 methods of making infusoria (you cannot buy it, or buy cultures of it, it is the bacteria that eat rotting plant matter and its spoor is in the air all around you). Making Infusoria Method 1: Cultivation of infusoria is comparatively easy and can be done by putting lettuce or spinach leaves in a quart jar with aquarium water and several snails. Allow the greens to decay, the snails eat the rotting greens and their droppings result in the development of pure Infusoria. Easy Method for Infusoria 2: The spores are airborne so you do not need a starter culture, only a suitable medium, and food. Take an open jar of aquarium water and drop in a piece of lightly boiled potato. After about a week, the water will be cloudy with infusoria. To feed the fry, just pour some of the cloudy water into the tank and top off the jar with fresh aquarium water. Having about five cultures on the go at any one time should keep your fry supplied with infusoria, easy simple no mess! After a Week of Infusoria, Switch to Microworms: You will need to buy a culture, go on eBay, it is extremely cheap to buy a starter culture. You need these before baby brine shrimp but you can eliminate the need to grow baby brine shrimp and skip that step by having a micro worm culture. These excellent little worms can be fed instead of or as well as brine shrimp. The worms feed on the surface of cereal-based foods such as oatmeal. To make a culture medium, simply cook up a little oatmeal in the usual way – use only water, and it should be the plain kind no flavor or sugar – then allow it to cool. Place a layer about 1/3 of an inch deep on the bottom of a very clean plastic tub type container. Put the culture you just purchased on top of the oatmeal in the middle of the container. Place the top on the plastic tub container with some air holes in the center of the top, and place the tub in a warm place. In a few days, remove the top of the container carefully, you will see the tiny worms climbing the sides of the container, simply wipe the sides with a clean latex glove and put a small amount in the water with the fish, repeat 4 or 5 times a day. After about a week makes a new container of oatmeal, take a spoonful of the old oatmeal with the worms, put it in the middle of the new and you have a new batch. Fourth Week: Your fry is well along and can eat most anything. Feed well and in about 4-6 months you will have nice fish to give friends or even sell to a local store or online, enjoy your success! One Last Note: Although the building of the bubble nest and care of the young is normally the work of the male, females Paradise Fish have been seen to do both. Presumably, should a male be killed after the eggs are laid, a female can take over his work. That, however, cannot be the whole story. In aquariums, it has been observed, females ready to lay eggs but having no male present will build a bubble nest and lay their eggs, unfertilized. It has even been known for such a female to be helped by another female, In one instance an aquarium keeper kept a male and female apart, by sliding a sheet of glass between them. The male started to build a bubble nest on one side of the glass and the female started one on the other side. When the aquarist noticed this, and before he could move the glass, the female had laid her eggs under the bubble nest on her side of the glass and was trying to keep the male, who was still on the other side of the glass away from her eggs.